Yikes this is getting out a little late but thanks in advance for your understanding! We had a good week working on writing the letters A and I. I am not sure why I was not worked on ealier as it seems to be a pretty easy letter, but both letters were great to practice as they are both in Big Sister's name (and she writes them incorrectly every time! Well, not any more. Now she can do a little a and little i!). handwriting page (here) - write "A A A a a a" or "I I I i i i" and be careful of all extra links/downloads. I was a little nervous that the Is would look funny but when I printed it out they looked just fine. It was interesting that she wanted to write the first line of the capital A as a straight up and down line but then realized that it is a diagonal line. We had the opportunity to talk about the different directions that lines can be drawn. It was an interesting conversation. Then the little a (one I've been wanting her to work on for a while) was a challenge. I did put a "dot" at a different starting place, much closer to the line that you draw down, so that she didn't make a circle/O and then lift her pencil and make a separate line for the little line down. Does that make sense? So, there you have it....honestly, no kiddo ever wants to do everything a parent wants them to do, so there will be conflicts. But I have found that if I make her laugh (like that day I said "oh good, keep crying I'm going to get this on camera to put on my blog. No...stop laughing. I can't take a picture of you laughing. Go back to crying") we move past the moment and she does what she really does want to do. And in this case, it's learn to write her letters so that she can write notes to her friends. Another thing I'd like to mention - rewards work. I don't always do big rewards. I don't always do food or sweet treat rewards. But we always do something at the end of a challenging task. Learning is a reward in and of itself, but children need to learn that learning is fun. Some good "rewards" we've done are getting the markers to write on the windows (see that post here) or getting to go to the library to get some books and CDs about a topic we just learned about. We've done our task extra BIG, like make a big happy birthday poster, when we are learning about letters or we make a shape chandelier when we are learning about shapes. If you say it's a prize, it's going to seem like a prize. We've even used broccoli as a reward. "Ok, you get to have more broccoli if you eat your chicken" You may laugh, but it's worked more than once! What do you use a creative rewards? 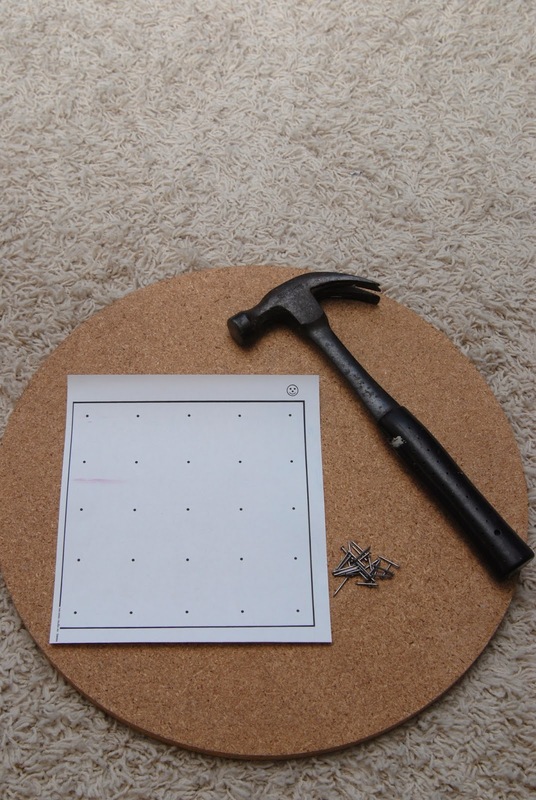 After practicing our letter we made our own Geo Board! I've been interested in making one of these for a while and so now I had an excuse! 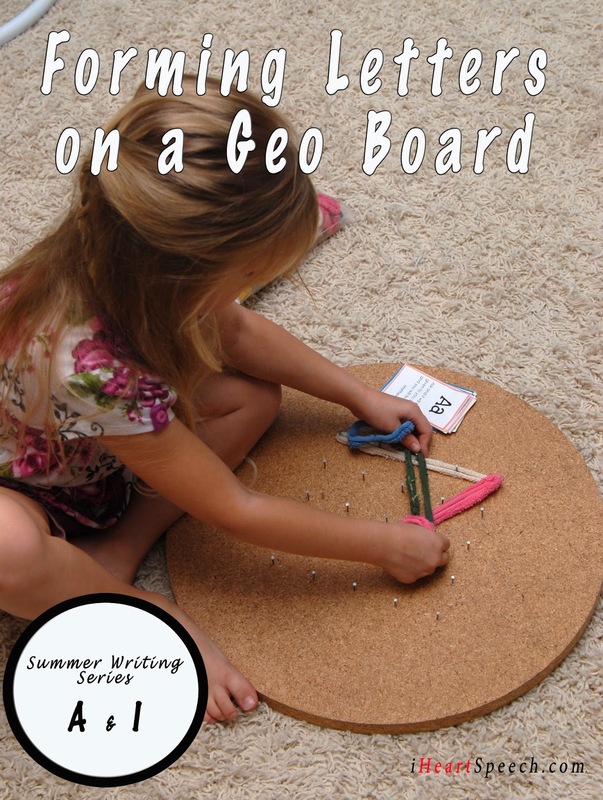 There are lots of things that you can do with geo boards (just search geo board on pinterest, you'll see!) This is the pattern that I printed (here). We found an old piece of wood in the garage, gathered our supplies and printed the pattern. Then we got to work! After her awesome construction project a few weeks ago (see that post here), she felt like she would be able to hammer in all of the nails by herself, but the wood was very hard and after a few attempts decided that it would be better if she were the nail giver instead of the nail hammerer! Finally it was complete! I found some old loom loops from a project I did back in graduate school (I knew I hung on to those things for a reason!) and we got to work making letters and shapes and pictures of all sorts! If you don't have loom loops, rubber bands work and I've seen people use hair bands, too. Little W wanted to play too and enjoyed tossing the loom loops on the board and seeing where they landed. He didn't quite get the concept of stretching them over the nail heads to create something, but that's ok, he had fun right along side of us! The letter I was one of the easiest letters yet. We got to talk about the differences between long and short lines as well as the middle, the top and the bottom of the writing space. Lots of good language skills! Then we baked a cake together (nothing fancy, just from a box!). 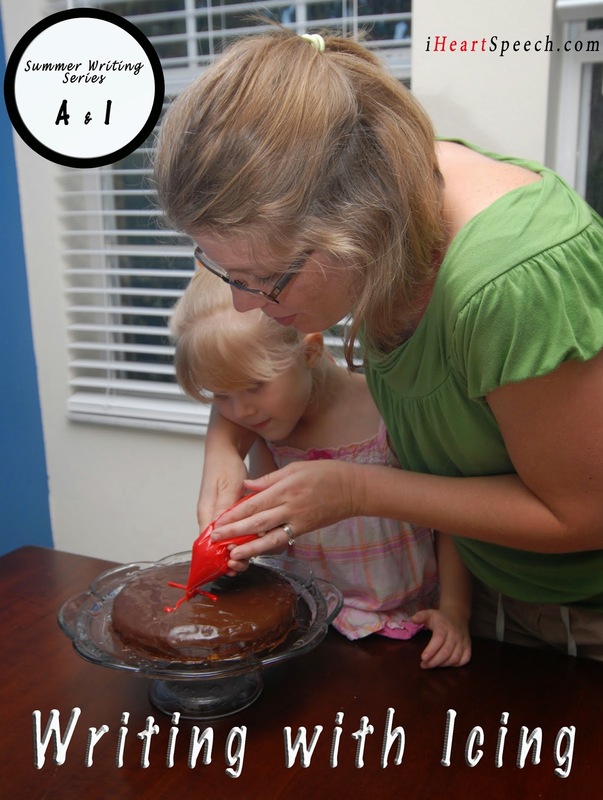 We warmed the chocolate icing and poured it over the cake and got to writing our letter I. She did need help with holding the baggie of icing (which I thinned out a little with milk to make it squeezable). And what goes better with the letter I than a sweet note? 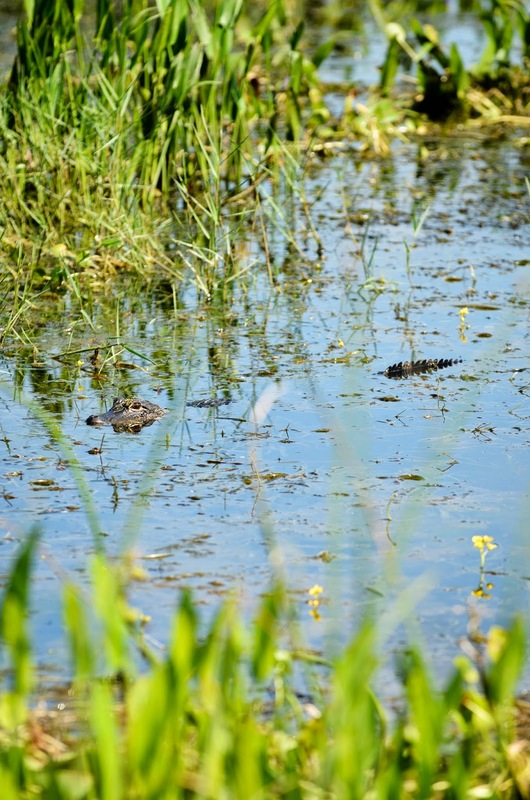 Our Field Trip this week was to go see the alligators at the Orlando Wetlands Park (website here). They do free tours of the park on golf carts on Fridays and Saturdays. We've "hiked" it before but thought that a ride would be more fun and cooler too. We were right! It was great. We had two tour guides. One was a bird expert and could tell us all about all of the birds she spotted. The other was a plant expert and he could point out and name any plant we were interested in. My favorite flower was the duck-potato flower. Beautiful! 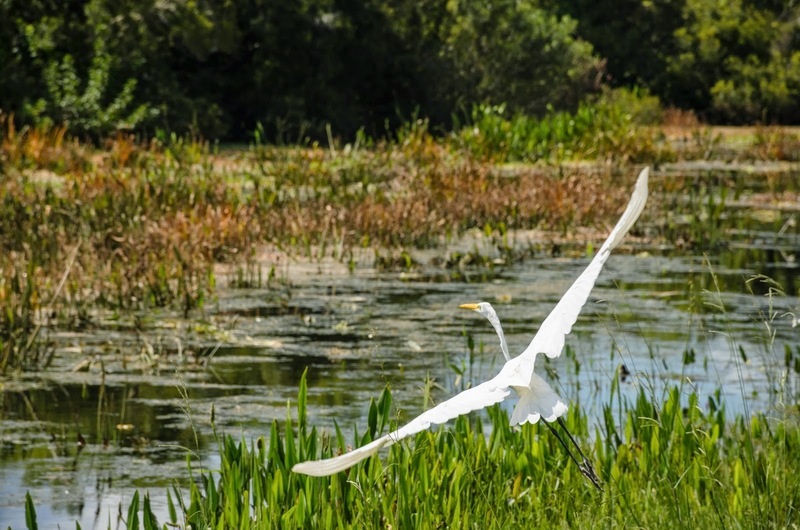 We got to see a few alligators, a soft shelled turtle, a gofer tortoise, tons of birds and lots of flowers! And the only snakes we saw were in cages in the education center! Which, as it turned out, was featuring Insects. That was perfect to go along with our letter I! A for Alligator, I for Insects! I love it when it works out perfectly like that! 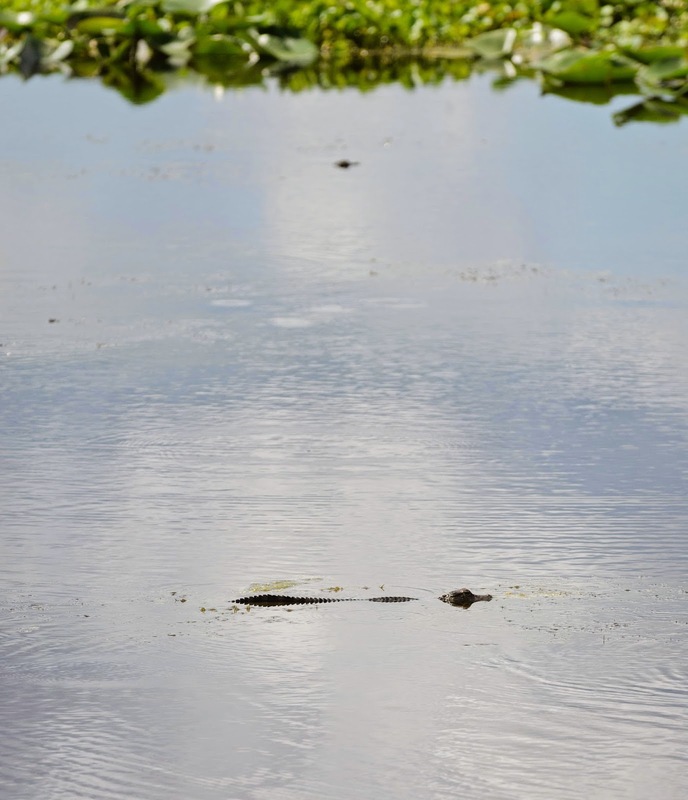 If you are not from around here, there are lots of places that have "live baby alligators!" We have a few mini-golf places that advertise that feature. Some hotels do too. Other field trip ideas could be a trip to an apple orchard, even if it is not apple season, I bet it would be beautiful this time of year! You could also visit an airport to see the airplanes. We had a great time visiting one last winter. Check that post out here! For I, you could visit a local pet store to see the Iguanas. Or visit an ice cream shop. There have been times that I do not want to spend "that kind of money" on ice cream. One time, when I was pregnant with Big Sister, we went on a date night to Target, bought a 1/2 gallon of our favorite ice cream, got 2 spoons from the cafe area and sat right there an enjoyed our ice cream. We got teased a little by some other shoppers, all in good fun, about a pregnant lady eating ice cream right out of the container, but it was a great date night. I bet it would be a great family field trip, too! 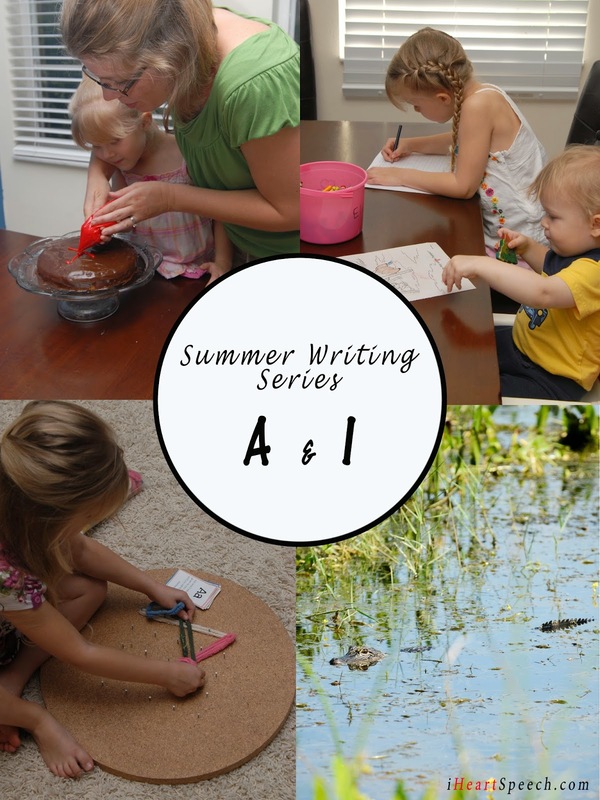 Well, our summer is coming to an end very soon which means that so will our Summer Writing Series. I have some ideas as what I'll be writing about in the fall and I'll be leaking information about a book that I am working on. But, what topics are you interested in learning more about? Is there some area of speech or language development that you would like me delve more deeply? Let me know! I want to keep my blog as relevant and informative as you want it to be. And truly, I do want your feedback! Thanks in advance!